The Shirt-Collar" is a short-short story offering an important lesson: Be careful how you act, for some day you may find yourself in the rag-bag! “I shall not tell you,” replied the garter. 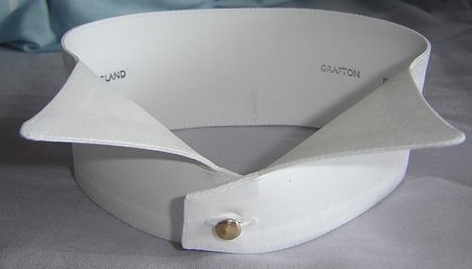 “Where do you reside when you are at home?” asked the shirt-collar. But the garter was naturally shy, and did not know how to answer such a question. “I am a fine gentleman certainly,” said the shirt-collar, “I possess a boot-jack and a hair-brush.” This was not true, for these things belonged to his master; but he was a boaster. “You old rag,” said the flat-iron, driving proudly over the collar, for she fancied herself a steam-engine, which rolls over the railway and draws carriages. “You old rag!” said she. “I should think not,” replied the scissors. “What! is he going to propose to me?” said the scissors, and she became so angry that she cut too sharply into the shirt collar, and it was obliged to be thrown by as useless. “Engaged!” cried the shirt collar, “now there is no one left to propose to;” and then he pretended to despise all love-making. Add The Shirt-Collar to your own personal library.